In my previous TBS/EOTC blog, I described the trials endured before the show, and now I’ll get to the real meat (soy, of course) of the concert experience, the performances themselves. 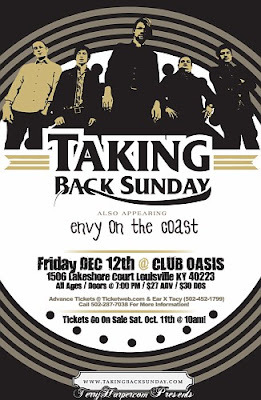 So, let me set the scene for you again: it is December 12th and the show is the Louisville, Kentucky stop on Taking Back Sunday’s winter tour with Envy on the Coast. On December 12th, 2008 at 7:30 in the morning, two souls found themselves alone and freezing on the carpeted front steps of The Oasis bar and concert venue in Louisville, Kentucky. The only company they shared was that of cigarette butts, foreign newspapers, and forgotten and molding cheese and crackers. Having suspected similar souls would be partaking in the same activity, the two had set their hotel alarm for the “wee hours” and rushed to the bar, which faintly resembled a run-down mosque. Those foolish two were my friend and I, and the more intelligent concert-goers did not start showing up until we had been there two hours, much to the relief of their toes and other freezable appendages connected to them. Hey, guys. 'Tis the day all this mistletoe and wrapping paper has been leading to, 'tis the day of giving and gorging, of family and friends, and of creepy Christmas videos, of course. "X-Mess Detritus" is the 18th short film of an online film festival put on by Glass Eye Pix. The "film festival" features a daily short film for each of the 25 days leading to Christmas. All of the films have a horror-holiday theme. You can view more by visiting CreepyChristmas.net. So, about that promise I made to blog more frequently, and moreover - to even match the massive amount of blogging My Chemical Romance now do on their website... Yea, I lied. You can go ahead and call me a liar. Excuses are lame, but I have them. The week I made that promise, my father suffered a heart-attack, then I got super-busy. Currently, I have writer's block, and have been focusing on my art and "creative writing" as a means to focus my emotions. I am also busy helping pick the new round of MCRmy Medics- an anonymous group who work through e-mail and the My Chemical Romance street-team to help those who are in emotional need. This time around I'm even more involved with the medics than I have been in the past. I couldn't be happier about my position, because I love helping, but it does take a lot of my time and attention as it should. So, about that challenge I made to myself about doing a blog-for-blog with the MCR site... I'm a bit behind, but I will catch up. I just needed to do a little living to gather blog-worthy materials. Now that I have them, you can expect those promised extra blogs, but maybe not this week, for; I have busy and exciting times ahead of me, friends. Shopping for my mother's Christmas presents and drinking the hell out of a lot of coffee. You can probably expect a few late-night/ early tomorrow morning blogs for this reason. SEEING TAKING BACK SUNDAY IN Louisville, KY.
Blogs of elaboration will follow.